In 1988 two young men brought to market a product they knew in their hearts would create an entirely new product segment that would change the recreational products industry forever. These two men were the sons of two men who attempted to do the same thing 20-years prior, but proved to be ahead of their time. 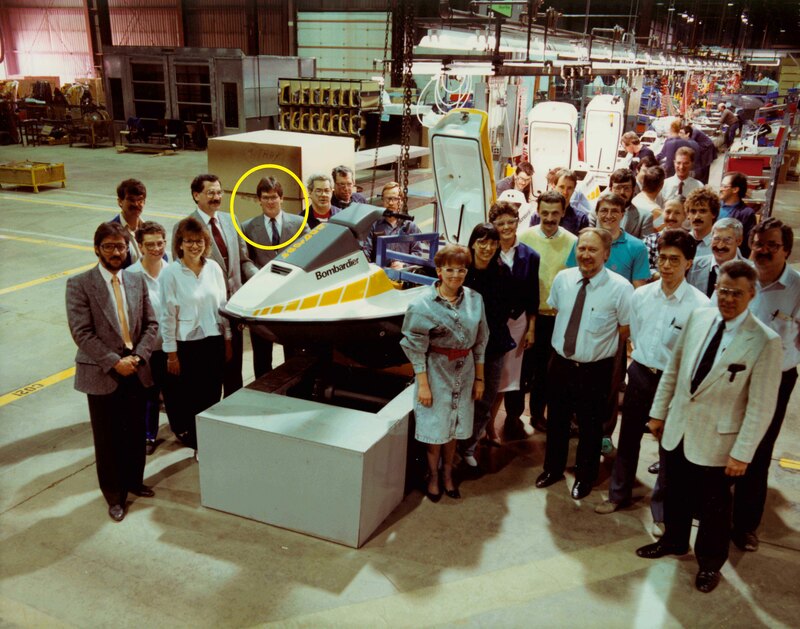 In 1988 it was the right time for Pierre Beaudoin (who is now CEO of Bombardier Inc. and son of Bombardier and BRP chairmen of the board, Laurant Beaudoin) and Denys LaPointe (who is now Vice President of BRP product design and innovation and son of Sam LaPointe) to launch the modern Sea-Doo watercraft. Doo watercraft coming off of the Valcourt, Quebec production line. The 1988 Sea-Doo 5801 model changed what a watercraft was and could do. It was the first two-passenger watercraft with a V-Hull (thus the V-Shape of the logo between the ‘A’ and the ‘D’) rotary-valve engine producing a class leading 55 hp, and capable of cutting through chop and physically capable of pulling a skier (legally, you must now utilize a three-seaters to tow). The 1988 Sea-Doo gave birth to an industry with huge potential and gave Ski-Doo snowmobile dealers a product to market when it wasn’t snowing. A lot has changed over the past 25 years for the modern Sea-Doo watercraft with technological advances outpacing nearly every other motorized product in the world. As a result of these advances and focus on on-water performance, fun, and safety, well over 1.2 million people have bought and enjoyed Sea-Doo watercraft with their families and friends. BRP has been the market share leader in the watercraft industry for 19 of those 26 years and this stems from the passion Bombardier and now BRP puts into every product. Jose Boisjoli (the current President and CEO of BRP) leads the company with the mantra, “product is king” and no where has that proven more true than with the modern Sea-Doo watercraft. We take a look back over some of the milestone Sea-Doo watercraft models, innovations, awards, accomplishments and fun over the past 25 years. The Sea-Doo brand story is one of historical magnitude in the power sports and marine industries as very few brands have dominating an industry the way the Sea-Doo brand has led the personal watercraft industry. 1990 marked a monumental year in the personal watercraft industry. Bombardier would invent a new segment in the fledgling industry with the introduction of the Sea-Doo GT (grand touring), the first ever three seater-watercraft. 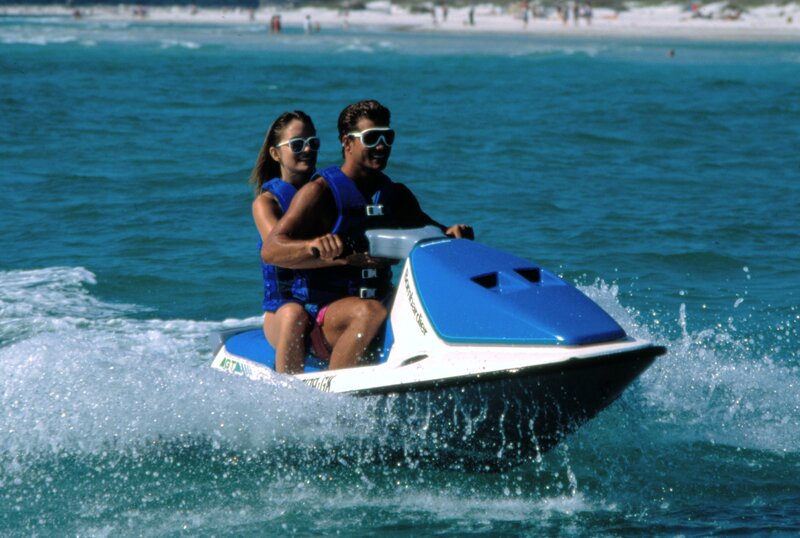 The GT wasn’t alone as the 1990 Sea-Doo watercraft line included three new models and added in a touch of color. The Sea-Do0 SP was introduced as the base model and the SPi was a step up (the “i” stood for stainless steal impeller, that was a substantial performance gain over the standard aluminum cast impeller) and of course the GT model. The Sea-Doo GT received its share of criticism as industry insiders argued if people really wanted to ride three-up on a watercraft. What the GT did offer was a legal platform to pull skiers with that opened an entirely new usage of watercraft with room for a driver, observer and skier. The longer platform with a, relativly, oversized storage bin in the bow made ‘touring’ a reality on watercraft. The 1990 Sea-Doo GT also included reverse, substantially assisting in docking situations. Little did anyone predict that eventually three-seaters would eventually make up roughly 90% of the market. The 1990 Sea-Doo GT was a monumental watercraft in the history of the industry.